Leylandii hedging is the king of the hedges. Leylandii is tough, responsive, a haven for wildlife and does a wonderful job. It grows quickly in most types of soil so long as they are not waterlogged and respond well to annual clipping and regular watering in their first year whilst establishing. Leylandii hedging likes full sunlight and does not like being shaded by other trees which make it grow rather thin with time. Leylandii can be clipped tightly to produce a dense hedge that acts as a solid visual barrier and absorbs much sound and pollution. Leylandii is also known by its full name Leyland Cypress (x Cupressocyparis leylandii).  Scroll down to find out further information about Leylandii hedges. Why should I plant a leylandii hedge? Leylandii has been an incredibly popular hedging plant for a long time and continues to be one of our best sellers. It is fast growing, evergreen and produces a dense green hedge in a short period of time. 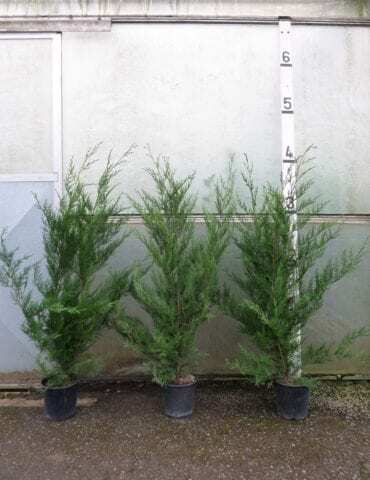 How tall will leylandii grow? People often ask how tall leylandii will grow and the simple answer is that they will grow as tall as you want them to. 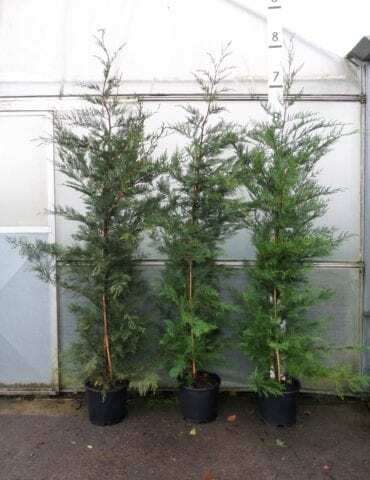 They will produce an excellent hedge of any height from 5-20ft, although most people tend to grow their leylandii hedges to 6-7ft in height which is usually more than adequate for most gardens. How quickly will a leylandii hedge grow? People often associate leylandii with being extremely fast growing and often getting out of control. Leylandii do grow fast after they have been planted and can put on 2-3ft growth in their first few years after planting. However, once the hedge has reached its desired height it should be trimmed at that height accordingly to maintain its size and density. This will slow down the upward growth of your hedge to a much more manageable level meaning it can easily be trimmed once a year. We hear reports of leylandii hedges getting out of control and in almost all cases, this is as a result of the owner neglecting the hedge and not managing it properly, it is not the fault of the plants themselves. When should I clip or trim a leylandii hedge? A leylandii hedge will need to be clipped annually in the Spring or Autumn as you would with any other hedge. How far apart should I plant a leylandii hedge? 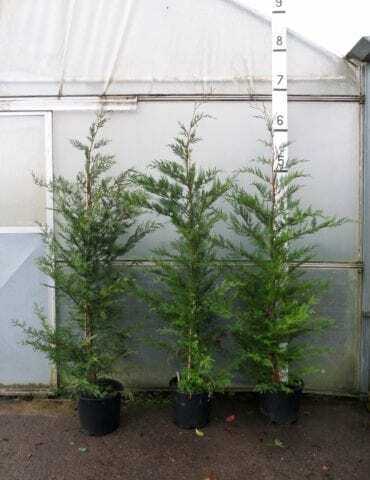 Leylandii should be planted 2ft (60cm) apart regardless of how tall or short they are when you buy them and careful preparation of the planting site is important. See section below on how to look after your leylandii hedge after planting. How do I look after my leylandii hedge after planting? Although leylandii plants will put up with most soil types, we recommended that the planting soil is mixed with compost to give the plants the best environment to grow in for their first year. After planting, your leylandii hedge should be watered regularly during its first year to give it the best chance of survival and this is especially important if your hedge is being planted in the drier summer months. How do I water my leylandii hedge? Watering a leylandii hedge is especially important if you are planting during the summer or a dry period. For watering, we recommend using leaky hose (sometimes described as porous pipe) which can be connected to your existing hose pipe and will slowly leak water onto the roots of your hedge in a controlled manner to ensure that it soaks in and your hedge becomes properly watered. Leaky hose is cheap, easy to install and very effective. See our Accessories page for more details on leaky hose. Is leylandii tolerant of different soil types? Leylandii will tolerate most soil types (including dry sites) but do not like being in waterlogged soil. Leylandii will grow extremely well in full sunshine. They do not like growing in shady spots and don’t grow well under the other trees. We usually stock a large selection of different sizes of leylandii throughout the year.